Use these sample cultural fit interview questions to identify candidates who share your company values and are more likely to thrive in your work environment. Your culture is a reflection of your company’s values and mission. It shapes your employees’ way of working. There’s no right or wrong company culture. But hiring employees who fit well with yours increases your chances of achieving business goals and helps you foster an engaging work environment. It will also improve your retention rates. There’s a catch, though. Cultural fit doesn’t mean hiring people you like or being discriminatory. Hiring for culture fit means recruiting people who will thrive in your environment. Before you start interviewing candidates, define your company’s values and long-term objectives. Then evaluate whether candidates share the same values as you. Use your questions to identify toxic behaviors in potential hires before you make a hiring decision. Do you prefer working alone or as part of a team? Why? Describe the type of work environment in which you are most productive. How do you prefer to get feedback from your manager: through formal performance reviews or daily/weekly meetings? Why? What do you hope to achieve during your first six months here? What would make you quit a job in the first month? What would you say or do to motivate your team during a challenging project? What’s one thing you like about your current (or prior) job and you’d want here as well? Have you ever found a company policy unfair or inefficient? If so, what was the policy and why? What did you do or what would you do, in this case? Your manager assigns you a big task right before the end of the day. How would you reply? How would you change an institutional “this is how we always do it” attitude, if you felt there was a better approach? New hires can add to or disrupt your company culture. 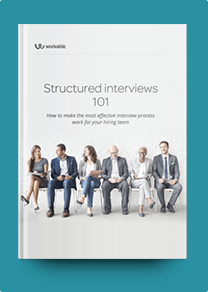 If you’ve established an effective culture, recruit candidates who closely embody it. Or, hire people who will enhance it. Mind your future goals. Prioritize candidates who will nudge your teams in the right direction. For example, if you’re planning to scale, hire employees with solid leadership skills who will help you reach challenging targets. Make sure your questions reflect the sub-culture within the specific department you’re hiring for. For example, an engineering department is likely to have different work habits and goals from marketing or sales teams. As culture is closely tied to behaviors, talk to employees who interacted with candidates before and after the interview (e.g. the receptionist or the security guard.) A friendly and polite person wins over a rude and arrogant one. At the same time, don’t outright reject introverts who mightn’t feel comfortable with small talk. Remember: Candidates also have a say in whether they’ll fit well with your company. Let them see the job first-hand and decide if they’ll fit in. Give them a quick tour of the office and introduce them to potential teammates. Dishonesty. There’s nothing wrong with candidates who’ve done their research and give you answers that seem in line with your culture. But, if you suspect they’re simply trying to impress, probe with follow-up questions and ask for more specific examples. Mismatch in values. An employee will fit into your company if you share the same values, work methods and have common goals. For example, a process-driven candidate mightn’t be a good fit if your company prioritizes innovation and flexibility in all procedures. Likewise, an employee who seeks quick career advancement will be hard to retain in a position with no opportunity for promotion. Different leadership style. When hiring for managerial roles, take into consideration how each team works. For example, a candidate who has an authoritative leadership style may not be the best managerial fit for a team where employees work best independently. Inflexibility. New employees should balance adapting to your work habits with offering new ideas of how to do things. It’s a red flag if they show signs of arrogance and have a “know-it-all” attitude. Disrespectful of policies. It’s one thing to question the status quo and another to disrespect or ignore company policies. Candidates’ previous work experiences will reveal whether they follow company policies and collaboratively suggest improvements where they spot issues.